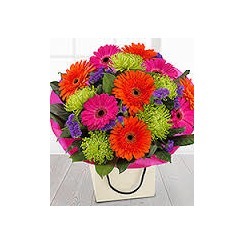 Vibrant handtied in hot pink and lime seasonal flowers. Please note that all flowers are subject to availability and substitutions may be made at the florist's discretion. Seasonal handtied in yellow and green shades. Please note that all flowers are subject to availability and substitutions may be made at the florist's discretion. 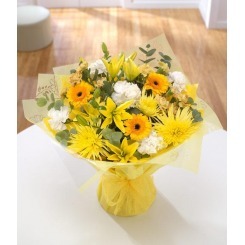 All the golds and yellows of Chrysanthemums, Lilies and Carnations with bright white frilly Carnations. Please note that all flowers are subject to availability and substitutions may be made at the florist's discretion. 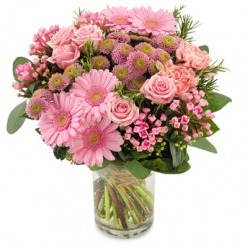 A perfectly pink bouquet of seasonal flowers (vase not included). Please note that all flowers are subject to availability and substitutions may be made at the florist's discretion. An orchestra of colour in one fabulous flower basket arrangement. Please note that all flowers are subject to availability and substitutions may be made at the florist's discretion. A bright and dramatic bouquet. If you're going for WOW this is the bouquet for you. Please note that all flowers are subject to availability and substitutions may be made at the florist's discretion. 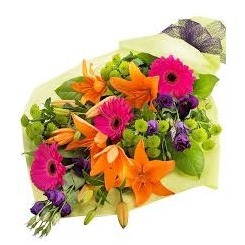 An eye catching bouquet that's simply bursting with colour. Please note that all flowers are subject to availability and substitutions may be made at the florist's discretion. 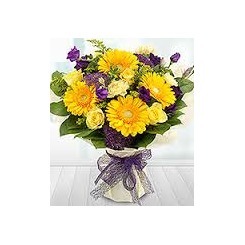 An aqua pack bouquet with a fabulous mix of bright yellow and deep purple blooms. Please note that all flowers are subject to availability and substitutions may be made at the florist's discretion. SAVING £109.40 PER YEAR! This package consists of one handtied bouquet a month for an entire year! 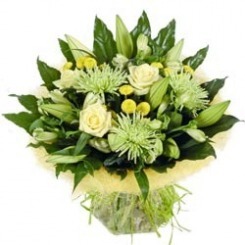 (Total of 12 bouquets in one year, normal price of £29.95 each including delivery). Our florists will create beautiful bouquets in a variety of colours and flowers to ensure that your loved one has a treat every month. 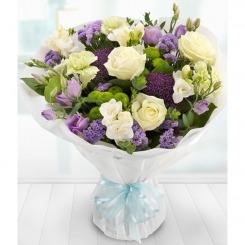 This bouquet comprises some beautiful nautical tones. Please note that all flowers are subject to availability and substitutions may be made at the florist's discretion.